Sturdy art desk provides plenty of storage. Features large work surface with molded-in compartments and hinged dry-erase writing surface that wipes clean easily and opensto storage area underneath. 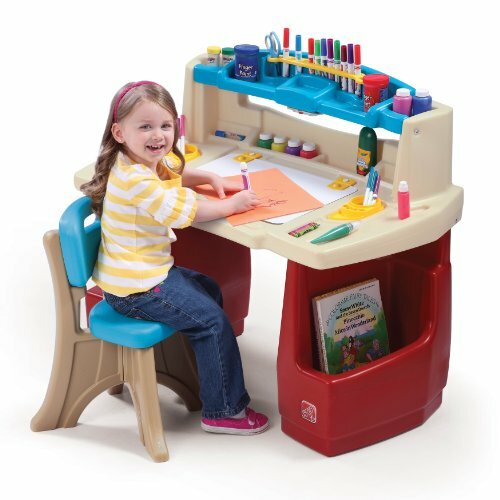 Includes a push-button light, and its raised shelf keeps art supplies organized. Item requires 3 “AAA” batteries, not included. Its four large bins hold art supplies within easy reach. The desk's vertical compartments store coloring books and tablets, while its coloring coordinates with playrooms and bedrooms. Item includes one New Traditions Chair . Adult assembly is required.